Gurjura Kingdom of Sindh. ca. AD 570 to 712. 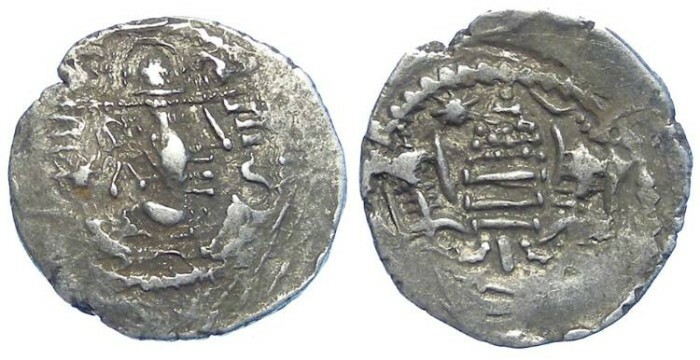 Anonymous silver drachm. This period of the Gurjura confederacy was troubled by repeated invasions by the Arabs, and it is not really clear if these coins were struck by the Gurjura Kings of Sindh or by Arab occupiers, or both. Date : these appear to be have been made from about. AD 570 to 710, but the style of this example is slightly crude which probably places it very late in the series. Size : 21.3 x 22.2 mm. Weight : 4.23 grams. Reference : MN 218 vareity. Grade : VF but with an incomplete strike as is normal for the later issues in this series. Obverse : Stylized Sassanid style head right, which appears to be based on the portraits of the Sassanid King Peroz.